OK, so this wasn’t actually a walk, it was a drive. After some lovely Cornwall walks in St Mawes and Pendennis Castle Falmouth we drove up the coastal road visiting St Just, Tolverne and Truro before heading back to Looe. Although you can walk the coastal path we drove to St Just Church Cornwall, the Smugglers Tea Bar at Tolverne and then on to Truro Cathedral. St Just Church Cornwall in Roseland is a very special 13th century Church, with a 6th Century Celtic heritage, in a unique waterside semi-tropical garden setting. A legend says that Joseph of Arimathea may have brought Jesus ashore here. There is also a Holy Well that you can visit in the woodlands. You can read more about St Just Church here. We then made our way up the coast to the Tolverne Smugglers Tea Bar situated at Tolverne on the Roseland (eastern) side of the River Fal on Cornwall’s south coast. The cottage itself dates back to the 15th century and is believed to have been built as a ferryman’s home, as this part of the river is an important crossing point between Truro and the Roseland peninsula. The route was also used by pilgrims travelling from London to St Michael’s Mount at Marazion. You can read more about the Smugglers Tea Bar here. Truro Cathedral and the Diocese of TruroA Diocese or See is a geographical grouping of parishes under the care of a Bishop. Cornwall had its own Bishop at St Germans, near Saltash, until the latter part of the 10th Century. The Cornish Diocese was then held jointly with the Devon Diocese at Crediton and then in 1050 at Exeter. Effectively the Cornish Diocese ceased to be a separate entity. Over 800 years later in 1877, after 30 years of intense lobbying, the Cornish Diocese was re-established at Truro. The Diocese of Truro covers the whole of Cornwall and the Isles of Scilly plus two parishes in Devon. Truro was not the only candidate for the siting of the Cathedral. Bodmin had been the medieval ecclesiastical centre of Cornwall, while the original Cornish See of St Germans also put forward a claim. The vicar of St Columb also offered his church! The merits of each place were much discussed and argued over. Eventually a Bill establishing the Diocese of Truro was finally passed by Parliament, on the 11th August 1876. You can read more about Truro Cathedral here. 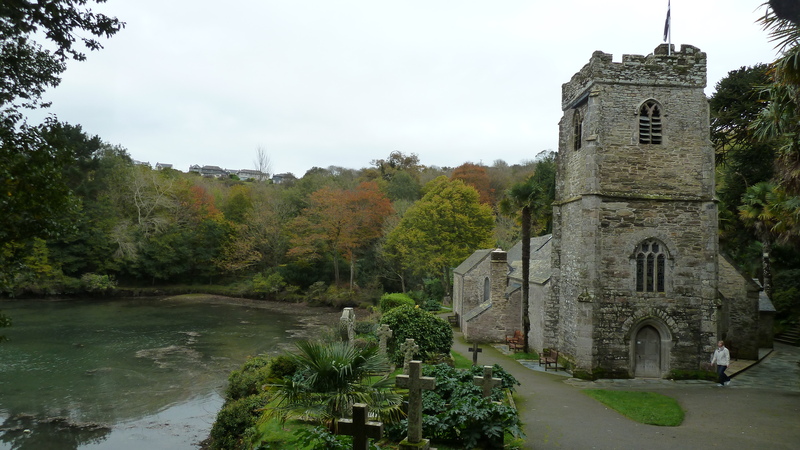 I visited St. Just in Roseland Church this summer with my daughter, visiting from Canada. My husband’s grandparents were married in the church and many Hicks ancestors are buried in the churchyard. We walked around the beautiful churchyard/garden and along the little path to the bar. We also spent time in St. Mawes where the family lived. All in all, a wonderful place to visit. What a lovely comment. Thank you. I’m glad you had a good trip.